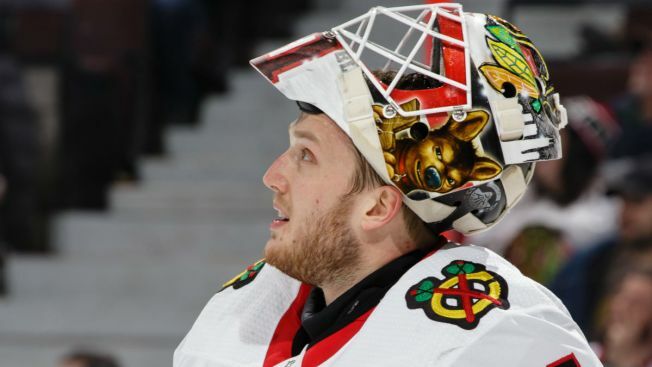 Anton Forsberg made 42 saves, Vinnie Hinostroza had a goal and an assist, and the Chicago Blackhawks beat the Nashville Predators 2-1 on Tuesday night. Last-place Chicago, which needs a big finish to get into the playoffs, returned from the All-Star break with its second straight win. David Kampf also scored for the Blackhawks. Kyle Turris had Nashville's only goal and Juuse Saros made 29 saves. The Predators lost in regulation for the first time since Jan. 2. Kampf got the lead for the Blackhawks at 3:03 of the first. On the right boards, Tomas Jurco knocked down an attempted clear by Saros and kicked the puck toward Hinostroza in the right circle. Hinostroza poked the puck off Nashville defenseman Roman Josi, and Kampf beat Saros with a wrist shot high to the glove side. Turris tied it with his ninth goal 2:12 into the second. Craig Smith forced a turnover by Forsberg behind the Chicago net. Smith passed to Scott Hartnell below the goal line, and he fed Turris all alone in the slot for his first goal since Dec. 29. Hinostroza got the eventual game-winner at 14:33 of the second. Nick Schmaltz carried the puck into the Nashville zone on the right side and sent a pass to Hinostroza at the top of the right faceoff circle. Aided by a screen from Predators defenseman Matt Irwin, Hinostroza fired a one-timer by Saros on the far side. Forsberg denied Calle Jarnkrok from the low slot with 1:30 remaining to preserve the win for Chicago.